Background/Purpose: Smartphone applications and social media (SM) are increasingly used, transforming the way in which people communicate. Peer interaction, remote information access and community building are just some of the uses of SM, presenting novel opportunities and challenges, especially for people with chronic conditions such as rheumatic and musculoskeletal diseases (RMDs). This study aimed to explore the perspectives of people with RMDs on using social media for health-related purposes. Methods: A questionnaire-based survey, co-designed in English by rheumatologists and patient research partners and translated into German, Italian, Spanish, Russian and French, was launched at the beginning of May 2018, distributed via patient organizations and SM platforms. We report on interims data analyzes after 4 weeks of data collection. Results: A total of 417 complete responses were received across 44 countries (50% of the UK, Russia, Spain and Italy). 13% of respondents were from non-European countries, with USA and New Zealand being the largest contributors. More than half of respondents were between 35 and 54 years, 87% were female, two thirds had >1 RMD, with inflammatory arthritis and connective tissue diseases being most prevalent. Sixty percent of participants had multimorbidity, with gastrointestinal, thyroid disease and hypertension leading. 38% were involved in patient organizations or as research partners and 65% had a higher education diploma. Practically all (96%) were using SM, half of them more than 6 hours per week. 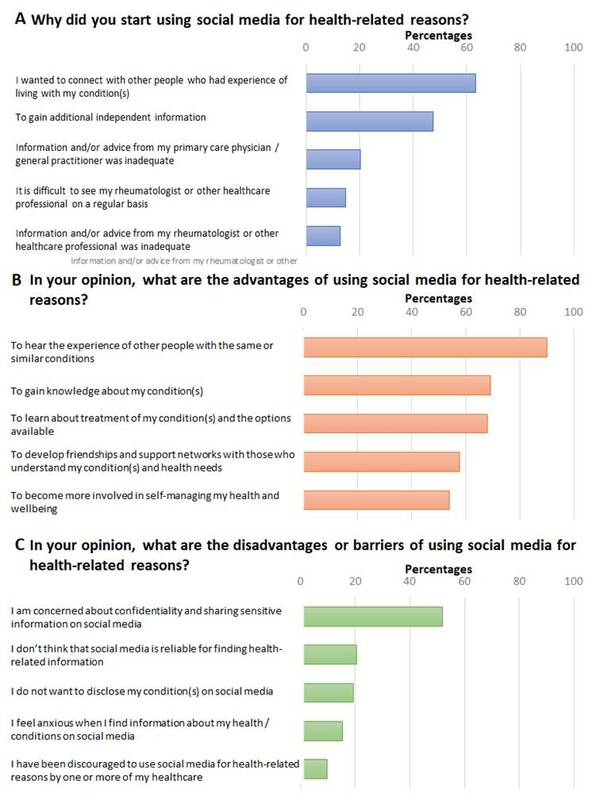 Three quarters reported using SM for health-related purposes, in particular to connect with other people living with the same condition (63%), with Facebook, YouTube and Twitter being the top 3 commonly used platforms (Figure 1A). There was an overall positive perspective for SM, as an easy means to acquire different experiences and exchange knowledge with peers. However, more than half voiced concerns regarding confidentiality (Figure 1B + C). Only 6% had experiences with virtual medical appointments, in most cases for follow-up, with 28% indicating to have more than one RMD. SM use was comparable between groups with different levels of multimorbidity, although general health rating was poorer than those with ≤1 comorbidity (p=0.002), they were older and more frequently considered that information provided by primary care physicians was inadequate (p=0.005). Conclusion: This study demonstrates that use of SM for health-related purposes is widespread among people with RMDs and is mainly used as a means to connect with peers and exchange knowledge and experience, supporting empowering patients in managing their disease. Despite concerns about confidentiality and the sharing of sensitive data, the considerable use of SM by patients with RMDs is impressive and represents new avenues to explore in health care. Disclosure: P. Studenic, None; A. Alunno, None; S. R. Stones, None; V. Ritschl, None; E. Nikiphorou, None. Studenic P, Alunno A, Stones SR, Ritschl V, Nikiphorou E. Social Media Use for Health-Related Purposes By People with Rheumatic and Musculoskeletal Diseases – Results of a Global Survey [abstract]. Arthritis Rheumatol. 2018; 70 (suppl 10). 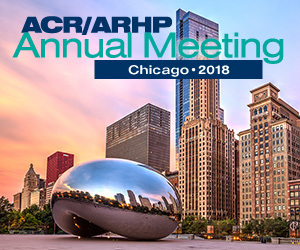 https://acrabstracts.org/abstract/social-media-use-for-health-related-purposes-by-people-with-rheumatic-and-musculoskeletal-diseases-results-of-a-global-survey/. Accessed April 20, 2019.